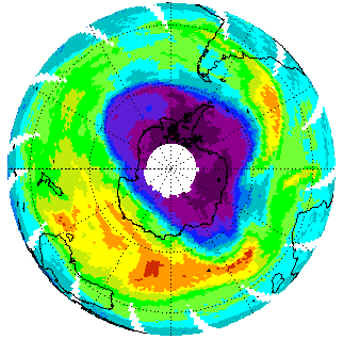 The Ozone Monitoring Instrument (OMI) is a nadir-viewing, wide-field-imaging UV and visible spectrometer designed to monitor ozone and other atmospheric species including aerosols. 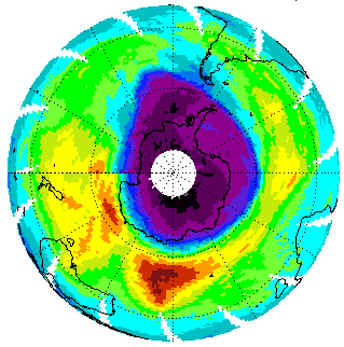 It is the key instrument on EOS AURA for monitoring the recovery of the ozone layer in response to the phase out of chemicals, such as CFCs. OMI will measure key atmospheric pollutants identified by the U.S. Environmental Protection Agency as posing serious threats to human health and agricultural productivity: O3, NO2, SO2 and aerosols. 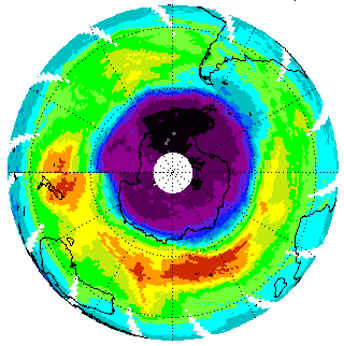 OMI effectively continues the TOMS record for total ozone measurements. 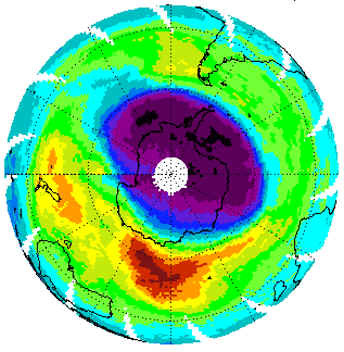 It is a contribution of the Netherland's agency for aerospace programs (NIVR) and also of Finland's Finnish Meteorological Institute (FMI) to the EOS AURA mission. 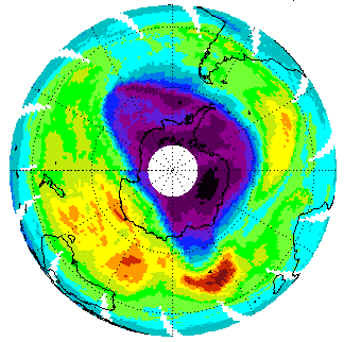 Map ozone profiles at 36 x 48 km, a spatial resolution never achieved before. Measure key air quality components such as NO2, SO2, BrO, OClO, and aerosol char. Distinguish between aerosol types, such as smoke, dust, and sulfates. 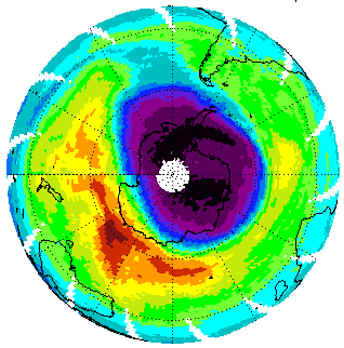 Measure cloud pressure and coverage, which provide data to derive tropospheric ozone. Map global distribution and trends in UV-B radiation. 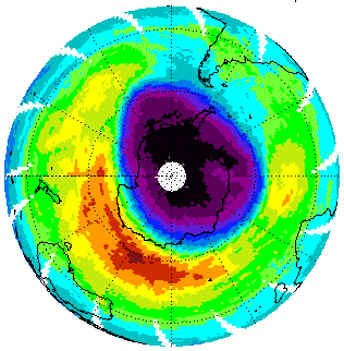 The OMI instrument will distinguish between aerosol types, such as smoke, dust, and sulfates, and can measure cloud pressure and coverage, which provide data to derive tropospheric ozone. 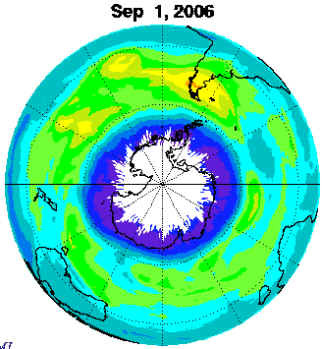 OMI will continue the TOMS record for total ozone and other atmospheric parameters related to ozone chemistry and climate. 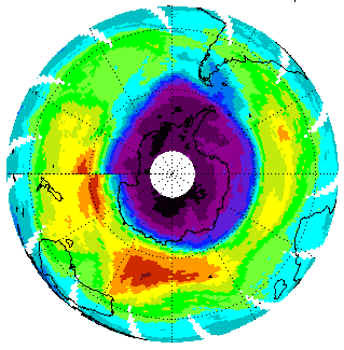 OMI measurements will be highly synergistic with the other instruments on the EOS Aura platform. The OMI instrument employs hyperspectral imaging in a push-broom mode to observe solar backscatter radiation in the visible and ultraviolet. 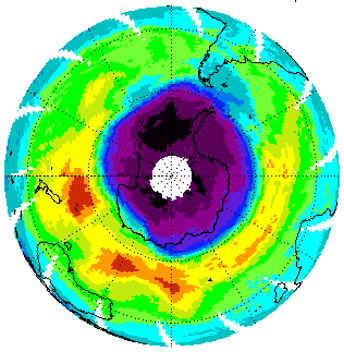 The hyperspectral capabilities will improve the accuracy and precision of the total ozone amounts and will also allow for accurate radiometric and wavelength self calibration over the long term. 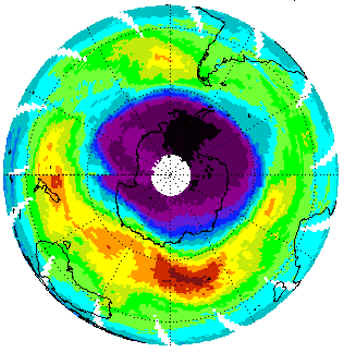 The instrument is a contribution of the Netherlands's Agency for Aerospace Programs (NIVR) in collaboration with the Finnish Meteorological Institute (FMI) to the EOS Aura mission. 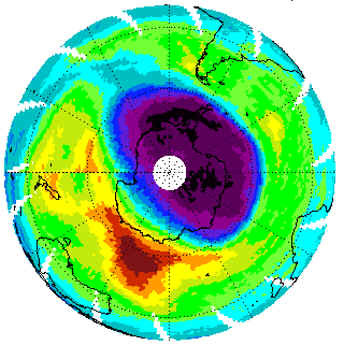 The instrument observes Earth's backscattered radiation with a wide-field telescope feeding two imaging grating spectrometers. Each spectrometer employs a CCD detector. Onboard calibration includes a white light source, LEDs, and a multi-surface solar-calibration diffuser. A depolarizer removes the polarization from the backscattered radiation. 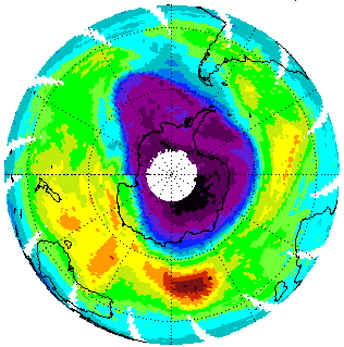 The white area on the images is where data cannot be retrieved in the earth's shadow or polar night regions by the satellite.